Ordet appeals to attention spans that could watch a windswept field for hours and feel rewarded with the arrival of a bull elk and its magisterial song. It is worth noting that the English translation of Ordet, a 1955 film by Danish director Carl-Theodor Dreyer, is The Word. It plays much like a parable: the message may not be immediately apparent, but allow the heart to dwell on it, and the soul will stir an answer – an answer that can’t always be readily explained but is entrenched in tears. The source material was written by Kaj Munk, a Danish pastor executed by the Nazis for proclaiming his fidelity to Christ over Adolf Hitler. I watched Ordet at the suggestion of a friend. He told me he viewed it because of its standing as a movie about faith. He said he seldom found time to watch movies, but rather than get ahead on paperwork as usual, he would watch it. “The stresses of my job were souring my attitude toward others. The last straw was when I called my sister lazy for being out of work the past year. I needed something to renew my Christian will,” he said. I, too, have recommended the film to friends of mine, many of whom have cast common nets of resistance: after all, it’s old, black and white, and subtitled. I don’t deny that the film is more challenging than the fare consumed by a typical weekend moviegoer. There are no gotchas, explosions or rapid-fire MTV cuts; Ordet appeals to attention spans that could watch a windswept field for hours and feel rewarded with the arrival of a bull elk and its magisterial song. 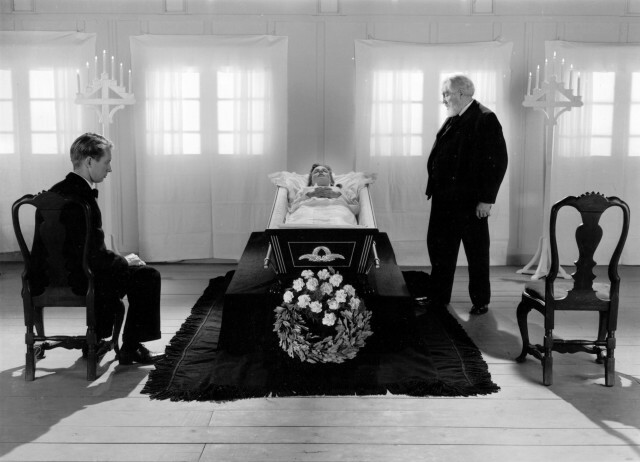 Ordet is set in 1925 in sleepy West Jutland, Denmark, a town whose controller is religion. Go counter to the popular view, and expect to be treated as an outcast, a heretic. Morten Borgen (Henrik Malberg), the father of three boys, has broken from the local church, clinging to a notion that doubts the Lord answers every prayer. His sons are Mikkel (Emil Hass Christensen), an agnostic awaiting a sign to compel him to believe in God; Johannes (Preben Leerdorff-Rye), a man meant for the priesthood who believes he is Jesus Christ personified; and Anders (Cay Kristiansen), whose desire to marry a tailor’s daughter is dashed by a conflict over religion between his father and the father of the one he loves. The movie begins with Johannes astray in the countryside, reiterating the Sermon on the Mount to no one, save an oncoming storm. Johannes is a wayward devotee of Soren Kierkegaard, a 19th century Danish theologian who preached “truth as subjectivity,” a forerunner of existentialism that contended it is not enough to believe Christian doctrine; one must actually live it. Kierkegaard warned, however, that such a pursuit ultimately leads to anguish: a person cannot easily juggle temporal existence and eternal truth. The story’s centerpiece is Inger (Birgitte Federspiel), Mikkel’s wife. Inger is a doer of goodwill: she is the one who begs Morten to set aside his religious hostility for love of Anders; she is the one who never judges her husband’s lack of faith; she, and her daughter, are the only ones who listen to Johannes, whose words are more prophetic than anyone realizes. Inger is the positive force everyone takes for granted. Morten does not hide his disappointment that Inger’s first-born was a girl; he needs a grandson to inherit the farm. She is again pregnant, this time with a boy. But she is ailing. While the doctor insists that his medicine has saved her, Johannes unpopularly argues otherwise. She will die, and only faith can resurrect her. Ordet is not unlike Michelangelo’s sculptures or Byzantine architecture. It is the holiest of art.